Spinach is a dark green, leafy vegetable that is packed full of nutrition. It can be eaten raw or cooked and served as a side dish, but it has also found its way to the center of main dishes. Spinach is a versatile vegetable, needs very little seasoning and is low in calories. 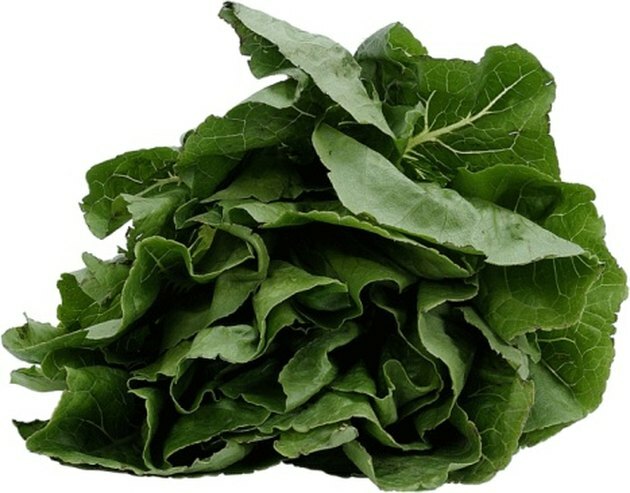 It has a high amount of iron, vitamins A and C, and moderate amounts of calcium. Adding fresh spinach to your diet is an easy way to benefit your health. Trim the stems off the spinach leaves with a knife or scissors. Put the spinach in a colander, and rinse it well with cool running water. Or fill a clean sink with cool water, and soak the spinach for a minute or two. Swirl it around with your hand to loosen any dirt. Or . Dry the spinach in a salad spinner or with paper towels. Pour the olive oil in large skillet with olive oil, and heat it over medium heat. Add the chopped fresh garlic or minced garlic, and saute for 30 seconds. Add half of the spinach to the skillet, and toss the spinach with tongs to coat with garlic and olive oil. Add the rest of the spinach, tossing it again with the tongs. Cover and saute for 1 minute. You may need to press it down a bit. Toss the spinach again, cover and cook for another minute. The spinach is done when it has just wilted. Place a large pot with 2 inches of water over high heat. Put the steamer inside the pot, and bring the water to a boil. Add the spinach to the steamer, and reduce the heat to low. Simmer, covered, for about 2 minutes. The spinach is done when it has just wilted. Use 1 or 2 tsp. minced garlic in place of fresh garlic. Toss the spinach with lemon juice or a homemade vinaigrette. Spinach loses great volume when cooked down.